ANOTHER APRIL VOTING INCENTIVE UP NOW! 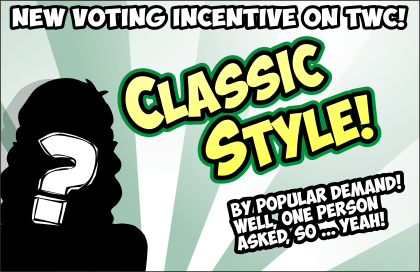 Just a slightly altered rehash of the last voting incentive, but hey, why not? VOTE TO KEEP THE DREAM ALIVE! Sometimes stuff gets real. Stuff just got real. And both like and unlike that slap. To be clear, I don’t really agree with Phoebe. Daphne’s young and she hurts and she doesn’t understand why. In my mind, Phoebe is trying to do what she couldn’t do with the slap. And that is get Daphne thinking differently. I don’t know if it’s a good thing or not, I just want to say that I like Daphne and want her to be happy. She’s just not really going about it well. Yeah, young people (read: TEENAGERS) are in a state of flux. The proverbial goo in the cocoon, if you will. If you want to get through to them, then you have to meet them where they are and that, usually, is in their feelings. I think it would’ve been better if she parsed nuance right then and there (these are the actions of a terrible person. Do you want to be a terrible person? ), but it is a four panel strip. I wouldn’t know if this is a good way to talk to Daphne or not. It may very well be, I don’t have a lot of experience except being a teen. I just felt someone should stick up for her in the comments. I also think Daphne’s a big part of the reason we HAVE a Puck comic. She’s why Puck had gone to university. I do admit that not Daphne’s innocent and Daph did push Phoebe overly hard. I likely did the same thing in different circumstances. Daphne’s a person and people stink. But there seem to be enough people luxuriating in that. Me doing so adds nothing to the conversation. So, yes, Daphne’s in the wrong. She needs to get shuck up so that she realizes it. This might be the way to do it. But that doesn’t mean that this is the only potential aspect to Daphne’s character. You are shockingly evenhanded and understanding. Which is weird for this comments section, where most people just bay for blood. Lie the scorpion, it’s in my nature. SCORE ONE FOR THE PHEOBES!!!! There is more than one Phoebe? Well, is this not the second point? I mean, last week was a little bit like a point. Or this is an extension of the same point from last weak? I’m confused. Doggy grrl is garbage grrl? Well done Phoebe. Well, you know dogs and garbage. That was surprisingly savage for Phoebe. Honest but like a sledge hammer to the skull. The guileless innocents are sometimes the most cutting. It’s like when a child makes a hurtful yet accurate observation. You can’t really contradict it, and you can’t get angry at the kid, but … ouch. Phoebe proved the point that the ability to say what we want without consequence is SORELY wasted on the young. Like a child at a wedding walking up to the bride and saying, “My mommy said she can’t believe you wore white.” We, the adults, need to have the right to do that! There are some adults who do this regularly. Though I will note that they’re often not very popular. Pheobe knows how to cut deep with a compliment. She would make a southern Belle. Phoebe is certainly a pseudo-southern belle in a number of ways. That’s a good descriptor, really. My mom was southern. I’ve known a lot of southern women. Not a single belle amoung them, they were the wrong class for that. Every last one of them were tough enough to chew nails and spit them out if they had to. Well, Phoebe really has none of the ‘southern’ in the ‘southern belle’. Just the ‘belle’ part. A northern belle, maybe? That … just sounds wrong. My brother was a friend in southern Ontario looking over the lake with a friend from Hattiesberg Ms. She said that for a moment there that she’d forgotten that she wasn’t looking at the Gulf. Sam noted that that’s why they’re called the Great Lakes rather that the Crummy Lakes. The section of southern Ontario along Lake Erie really is the Deep South of Canada. Like, they all grow tobacco out there and love their guns and … yeah. It’s weird. But seriously, I always liked that Crummy Lakes line. We also have lots of crummy lakes in Ontario too. It’s a lake-infested kind of place. But not LAKE Ontario. That’s a Great lake. Well, I knew you would agree. Wow, harsh. But Phoebe tells it like it is. Maybe it’s enough for Daff to have a good hard look at herself. And panel three is possible the most cutest, saddest, most puppy dog eyed Daphne has ever looked. I’m glad you liked the panel three Daphne pic. It took a bit of work to get it right. Agree, but panel 4 has the more expressive ears. Come out to the coast, we’ll get together. Have a few laughs. Oh hell, he was on both coasts for Christmas, and D.C. twice. Pheobe out here ending lives, man…..
Hey, she’s got a job to do. Well, she is a foundling. Always so rough on the poor girl. Well, true. And foundlings have a long, storied history in literature of being horrible people who destroy other people’s lives. She’s just holding up the tradition. If not, I want my three dimes and a nickel back. We gotta new FLA (Four Letter Acronym): THGP! Let it be known that I do not consider Daphne to be a lost case. Like your friend, she will get beyond this. I do sort of consider Puck a lost case, in that her nature is so ingrained there’s little chance of it changing. But Daphne? There’s hope. On the other hand, Puck may still have lot of time to change … like, do fairies age at all? Undetermined. Maybe slowly? Maybe none at all? The physical slap was just to lure Daphne into a false sense of security before delivering this haymaker! Do Phoebe’s horns swivel? Because that’s the only explanation I can think of for Panel 3. Yeah, that one’s a little off. Here’s the issue: her horns have a really weird orientation, in that they don’t hook toward each other. Rather, they hook backwards at an angle, where both tips point roughly toward the center of her skull. Which is really hard to draw sometimes. So in profile, it looks like both horns curve backwards in the same direction, but when viewed head on, the horns point toward each other. And in a three quarter view, I just kind of go with what feels right. But yeah, what obviously felt right for panel three was not in line with what felt right in every other panel. I love seeing explanations of problems with the artwork. It’s always nice to see into the creative process. I am happy to explain the problems. Because there are always many, many problems. That kind of comment is sure to hit harder when it comes from the resident airhead. The fool speaks truth! A tried and true trope. Talk about your growing pains! Now to see whether she’ll grow from this, or try to double down and deny her faults. I’m holding out hope for growth. We all hold out hope for growth. But not too much growth. Because self-actualized healthy people make for bad comedy. Or the horrible sting of reality? Nothing burns more than the horrible sting of reality. Panel 3 is a great epiphany. Now I’m on tenterhooks waiting to see how Daphne will process it initially and long term. Hats off to you. It’s bound to go in … interesting directions. I hope. I dunno. Maybe it’s going in boring directions. It’s hard for me to tell with my own story. Lol. I love Phoebe. :D she’s way too likeable.Funny she’s the devil’s daughter. Phoebe is undoubtedly my favorite. Which makes sense, because she’s the only character in this comic who is not some form of self-portrait on my part. Puck is like me, and Colin is like part of me, and Daphne is also a lot like me, but Phoebe? Phoebe is the amalgamation of my favorite character traits from other people (largely drawing from my wife and my kids and friends). So it makes sense that I like her. Yep, well-chosen words can slap way harder than a vicious backhand. I take back my comments regarding Phoebe’s nature. She may have let her emotions guide her too much in last week’s strip, but it’s clear she knows how to use words and tone to deliver a sting more sharp than a well-placed backhand. And to deliver those words in such a way not to provoke Daphne’s defensive emotions, but cause her to reflect critically about her actions and how they are not indicative of the kind of person that she truly aspires to be. I’m not sure any of Phoebe’s actions are the result of careful consideration or thought. She operates on instinct more than anything else. But her instincts have certainly led her to have an effect here. Which is good. Well, she’s been pretty much a garbage individual from the start. And the problem is, change for the better isn’t funny enough. So yeah, I expect she’ll finally recognize herself for what she truly is and try to be a better person…and then go right back to being what she was before without any remorse, because she enjoys being what she is too much to change. Well, I guess we’ll see. Daphne will always be Daphne. But there are many ways that Daphne could still be Daphne. Perhaps she could be a slightly better Daphne than previous? While still staying true to the inherently flawed nature of her being? Maybe….but right now, the only new things I expect Daphne to get is a replacement meat-grinder to use on a certain boy’s heart and brain…the onld one’s losing efficiency do to OVERUSE. OH PHOEBE! Saying something like that to Daphne could dog your relationship with her the rest of your lives. Was the dog pun intentional? If so, groan. But yeah, I think that Phoebe is speaking from frustration here. It could potentially affect their relationship in the long term. For the worse or for the better. Blunt, but no lies detected. Phoebe is incapable of lies. @EG, yes, my dog pun was intentional. I’d like to point out that words can be sharper than slaps, slugs, and pushes. I know from personal experience, as well as learning from others. Ouch! I felt that! Mind you, it’s a perfect description of Daphne’s conduct so far at the prom. Fortunately, I have faith Daphne can and will improve. If for no other reason than she thinks her being that way will frost Hannah . . . . . hey, small steps . . .
We can all have faith. Might be all we have, but hey. @Demarion, I hope Hannah shows up soon. She could provide some comic relief, so that things don’t get too serious. As for Daphne, I noticed she was able to smile while talking (actually, lying) to Tyler, so maybe she won’t go ballistic if or when Hannah reappears. Hopefully getting called out so harshly by probably the nicest person she knows will help straighten Daphne out a bit. Judging by the puppy-dog eyes, it definitely hit home. Well, things had to get cathartic somewhere in this story, or there simply wouldn’t have been a reason for it. Well, tomorrow, Anime Boston starts (or Boston Anime, I’ve decided which I’m going to, I have tickets to both). I will be on the lookout for Phoebe, Daphne and Puck cosplay. I will not bother looking for Colin cosplay because Bearded Young Guy is a rather easy costume and should not be rewarded. I can safely say that no one has ever, EVER willingly cosplayed as any characters from Puck. Ever. The lack of popularity, coupled with the fact that the comic tends to skew toward an older adult audience, means that few of the teen types who love the cosplay scene know of its existence. Even though I think the comic offers some pretty easy cosplay possibilities. This is no time for your rationality or reasonableness or any other word starting with R.
This is a time for going to bed early! Which I won’t. I just like that line about young beaded guys. Yeah, bearded guys wearing nerdy t-shirts? That’s really the dominant type at these things. Although, I wouldn’t call it Puck cosplay PER SE, there was a redhead with pointy ears and a mini-skirt. All she was missing was the Freckles of Doom. And something that looked like one of Puck’s actual outfits, rather than just any old thing in with a mini-skirt. Man, now I’m curious. Though there’s a lot of outfits in anime that are Puckish. Probably one of those teen-type anime shows I know nothing of. Phoebe Cosplay would generate a FLOOD of guys (and some gurls). None of which would give a Hockey Puck (kat is working overtime to relate to canucks) about Phoebe’s backstory. Phoebe cosplay would require a young woman of the cosplaying variety to be familiar with the comic. I’m not saying they don’t exist, but they’re not plentiful. And you don’t get far cosplaying as the character no one recognizes, so … hard sell. I think that look on Daphne is realization that Phoebe is not only describing her actions in this small span of time, but the underlying pattern of behavior that characterizes her. The concept of Phoebe being mad at herself for trying to change Daphne into something against Daphne’s nature rather than being mad at Daphne for being horrible is pretty harsh; yet accepting of who Daphne chooses to be. It’s just that Daphne is just now realizing that she is choosing to be a horrible terrible garbage person. The dress comment is just icing on the cake, as it plays into Phoebe delivering this with zero malice. Its one thing for someone to call you trash when they are angry. But when someone calls you trash and it sounds like they just said “the sky is blue” or “water is wet”, it gets you. Also, Phoebe forgot she dumped her physical stats for social manipulation earlier. Well, the dress thing is also funny. This is about the best breakdown I could ever imagine. Thank you.